With the launch of the tvOS 12 beta in June, Dolby Atmos support finally arrived on the Apple TV 4K. And though initial playback was limited to VUDU streaming titles, Apple has now started to add Atmos audio to several films through its iTunes app. Per a tip from HDD reader Bobby Stryker, iTunes now offers a growing collection of Dolby Atmos titles via the tvOS 12 beta on the Apple TV 4K. Atmos support is available whether streaming supported titles in HD or 4K HDR (when available). Likewise, Atmos tracks appear to be available for compatible titles regardless of how they were added to a user's library. This includes Blu-ray digital code redemptions, Ultra HD Blu-ray digital code redemptions, and iTunes store purchases. The initial selection includes a mixture of 4K and HD movies. For instance, Gravity is currently playable with a Dolby Atmos soundtrack but is not yet available in 4K. With that said, some titles known to have Dolby Atmos mixes, like Wonder Woman, are still only playable in 5.1. Likewise, the current iTunes spec details for some titles are not fully accurate just yet, as some movies are listed as having Atmos but still only play in 5.1 or 7.1. This will likely be corrected once the official release of tvOS 12 is launched in the fall. Beyond iTunes, the tvOS 12 beta also currently offers Atmos support through the VUDU app on the Apple TV 4K. Likewise, Atmos support is also set to be available for select Netflix titles. For more information on the beta, be sure to check out our initial impressions HERE. The full version of tvOS 12 is expected to launch in September. 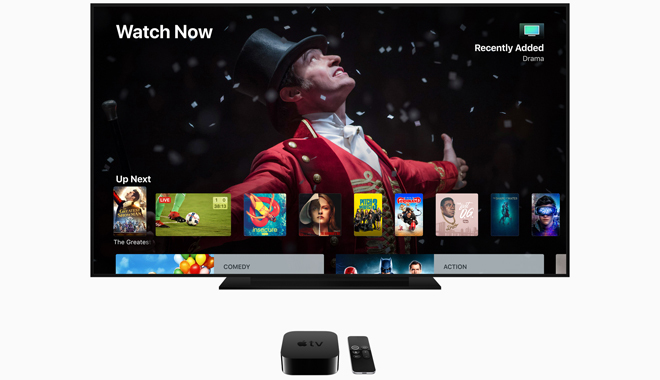 The Apple TV 4K utilizes the A10X Fusion chip and offers 4K playback capabilities at up to 60 frames per second with support for Dolby Vision and HDR10 content. In addition, the device includes 4K scaling for HD sources, Siri voice search, iCloud support for media sharing, standard AirPlay capabilities, and the ability to serve as a smart home hub for HomeKit accessories with remote access and automated control. Apple TV 4K models are now available in 32GB ($179) and 64GB ($199) versions.